The weekend was a bit of a lull between the success of the Stevenage Half Marathon and more than thirty Spartans expected to race at St. Neots on 18th so there is a chance to catch up on the New York Marathon. Two Spartans enjoyed the New York Marathon. On Sunday 4th November ADAM GUEST was able to tick one of his dream events off his bucket list – the New York City marathon. He said he has a huge affinity for New York having visited a couple of times, and this was my third time visiting as well as my third marathon. The course at New York goes through all five boroughs – starting on a long uphill over a bridge from Staten Island to Brooklyn and ending in Central Park in Manhattan. The crowd support was phenomenal throughout and the weather was a perfect sunny 11 degrees celsius. He later found out that this marathon was the biggest marathon ever with over 52,000 finishers. Spartan NIGEL STRONITHARM maintained an average of exactly ten minutes per mile and finished in 4 hours 22 minutes 11 seconds for 22,418th place. Nigel had a tough day at the office as he started the race carrying two injuries but as he was running for a charity close to his heart he pushed through and got the job done. Next week is all about rest & recovery and planning the next adventure. 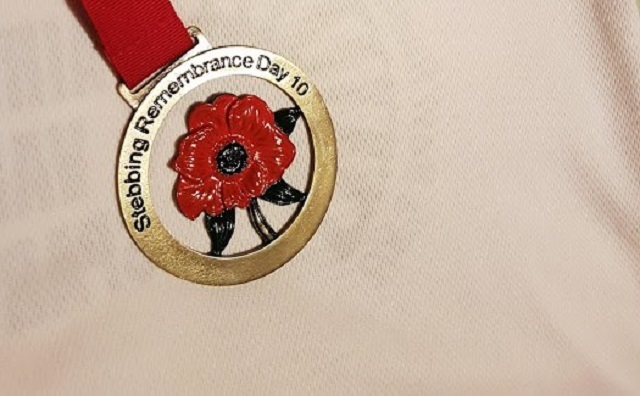 Only one thousandth of the number of finishers but the Stebbing Remembrance Day 10 is a great club organised event in the village of Stebbing, near Great Dunmow, and on nearby rural lanes. Runners gathered by the village church to remember the millions who have lost their lives in wars. By the 1105 race start it had become a sunny and surprisingly warm day though there was a strong wind which was a bit of a challenge particularly around mile seven. His preparation over the previous couple of days was not great and he was slow to get going in the first couple of miles but JIM BROWN enjoyed the race and finished in 1 hour 22 minutes 21 seconds. He was 162nd out of the 523 finishers. Spartan THOMAS SAUKA really gave himself a hard weekend. He volunteered to sweep the Druids Challenge on Friday, Saturday and Sunday. That’s a total of 84 miles without any deviations. There were three runs slightly over marathon distance along the Ridgeway to the Avebury Stones. Tom completed the first day in 8 hours 26 minutes for 61km running a few miles extra to rescue a French runner who was lost. Then finished stage 2, Saturday, in 7 hours 8 minutes. He had to walk the last 10 miles. Tom completed the final challenge on Sunday but had to walk the last 20 kilometres as a walker had blisters. So a total of more than 84 miles. This was the tenth year of the event. A sunny start to the middle Saturday of November saw 41 Fairland Valley Spartans head out to run in the weekly Parkrun events going on around the UK. Personal best (PB) runs were recorded for DARRYL STEVENS at the Lymington Woodside course in time of 37 mins and 50 secs, and NICK WITCOMBE at Wimpole Estate in 36 mins and 02 secs. While ALISON WOOD was the first lady home at the Stevenage event in 21 mins and 08 secs, joined by YUKO GORDON who was the third woman in 22 mins and 51 secs, JO BOWDERY in 24 mins and 50 secs, and DANNY SCANLON who was sixth overall in 19 mins and 55 secs. Further afield, NICK GILL was 14th overall at Wanstead Flats in 21 mins and 18 secs. Landmark runs were recorded in Stevenage for NICOLA DURENT who finished her 10th Parkrun in 42 mins and 06 secs, KERSTIN WEINER and PETER CARPENTER who completed their 20th events in 26 mins and 11 secs and 32 mins and 51 secs respectively, HAZEL JONES who ran her 30th outing in 37 mins and 41 secs, and ROGER BIGGS who crossed the line on his 40th run in 32 mins and 25 secs. In Bedford, JOHN NELMS achieved a time of 21 mins and 29 secs on his 40th Parkrun. NICOLA HATHERLY, NIKI PLUMB and RACHAEL MILLER attended the Bedford event for the first time and ran times of 33 mins and 13 secs, 36 mins and 05 secs, and 37 mins and 38 secs respectively. Also trying new courses were JOHN ROXBOROUGH at Jersey Farm in at time of 23 mins and 31 secs, MICHAEL O’KEEFE at the Gunpowder event in 25 mins and 35 secs, and TIM ROBINSON who finished the Wendover Woods ran in 27 mins and 21 secs. Top 100 runs at home in Stevenage saw MARTIN WOOD, DARREN EMMERSON, JAMES MCSWEENY, JONATHAN JONES, and DAVID PATTMAN finish with times of 22 mins and 15 secs, 22 mins and 45 secs, 23 mins and 36 secs, 24 mins and 40 secs, and 25 mins and 12 secs respectively. Also at the event ALISON SHELLEY ran 27 mins and 55 secs, SIMON SYPULA in 29 mins and 16 secs, KAREN PALMER in 29 mins and 17 secs, DAVE SMITH in 29 mins and 19 secs, SUE HAMER in 30 mins and 16 secs, ANGIE KEELING in 30 mins and 25 secs, DZENANA TOPIC in 31 mins and 06 secs, CLARIE EMMERSON in 31 mins and 10 secs, PAUL JENNINGS in 31 mins and 13 secs, CALLIE CHAPMAN in 31 mins and 21 secs, DAVE PEACH in 38 mins and 01 secs, and KAREN BROOM in 64 mins and 22 secs. Away from Stevenage, BARRY KING ran the Wimpole Estate event in 28 mins and 22 secs, ROWENA RUTLEDGE the Gunpowder event in 30 mins and 08 secs, and VERITY FISHER and DANIEL SUTTON who enjoyed the autumnal colours as they finished the Busby course in 25 mins and 17 secs and 25 mins and 18 secs respectively. Lymington Woodside 101 66 Darryl STEVENS 0:37:50 PB! 289 192 Nick WITCOMBE 0:36:02 PB!